Without new thinking on technology intervention, the future looks bleak. Unless the role of technology in the global economy is reconsidered, we risk becoming powerless to feed a growing population, combat climate change, meet energy demands and adapt to dwindling natural resources. The consequences could be disastrous – increased pollution, poorer living conditions, power struggles over limited resources, greater disease incidence and an erosion of personal rights – leading to a vicious circle of social and economic decline. This is an extreme scenario, and is only one of many possible futures. But it underlines the reality that we cannot afford not to take technology innovation seriously. Failing to change the way that we develop and use science and technology – or deciding to hold back on technology innovation – is potentially more risky than a radical rethink in the long run. Over the next 50 years, the world will face an increasing number of global challenges and, for many of them, technology innovation will play a key role in underpinning the effectiveness and resilience of the solutions developed. In 2009, the World Economic Forum identified nine global trends to stimulate discussion on innovation needs (Figure 2). 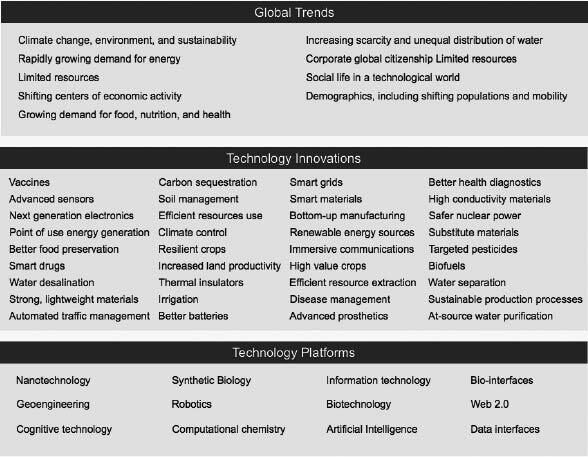 These trends – which range from climate change to corporate global citizenship – provide a useful framework for exploring how technology innovation might support a sustainable future in the light of developing challenges. But they also contain an implicit message – fail to act strategically on nurturing and implementing responsive technology-based solutions, and we risk being overwhelmed by the adverse consequences of these trends. In effect, inaction is not an option in building a sustainable future. 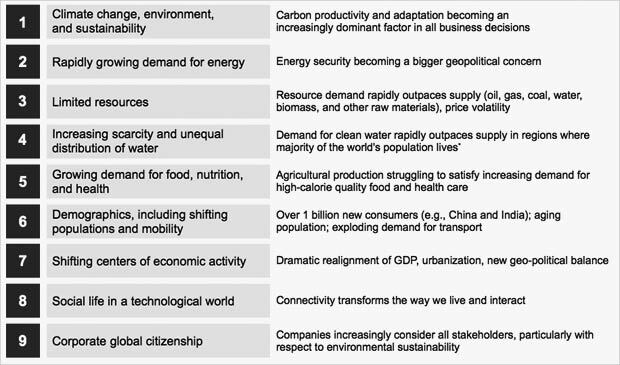 These nine trends touch on the impacts of technology innovation on resource scarcity, increasing global demands on water and food supplies, changing demographics, shifting centres of economic activity and moves towards a more interconnected global society. They are trends that will have a profound impact on the lives of future generations. In each case, they are trends where present-day actions will have a strong influence on how they unfold and are managed in the future. None of the trends are primarily focused on science and technology. Yet in each case, technology innovation holds part of the key to overcoming the challenges they represent. In this context, they beg the question: is the existing technology innovation pipeline sufficiently robust to provide technology-based solutions as and when they are needed? 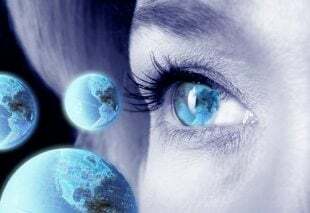 At a first glance, this question might appear superfluous – we are currently living in an innovation-rich world after all. Global trends show steady increases in published research and new patents (Figures 3 and 4). New technology platforms like nanotechnology, synthetic biology and robotics are grabbing the attention of investors, innovators and policy-makers. And hardly a week goes by without an announcement of a new “technological breakthrough”. Yet there is a real danger that we will become complacent by focusing on the problems emerging technologies can solve, rather than on the problems we need them to solve. The current technology innovation pipeline is geared to generating solutions in search of a problem. Sometimes there is a match; often there is not. This leads to the risk of orphaned challenges – global challenges that remain poorly addressed simply because the technology pipeline has not delivered a matching solution. Without a doubt, the unprecedented inventiveness of today’s global society provides the potential to realize technology-based approaches to addressing the nine trends in Figure 2. There is increasing global investment in technology platforms such as nanotechnology, synthetic biology, geo-engineering and information technology. These provide a foundation for new technologies to emerge, as well as new applications of existing technologies. Within these platforms and at the synergistic intersections between them, scientists, engineers and technologists are empowered to generate new knowledge and explore innovative new ways of using it. The result is a vast array of potential technology innovations. But the emphasis here is on potential. Figure 5 illustrates a possible progression from technology platforms through technology innovations to solutions that address the impacts of global trends. The illustration is indicative rather than inclusive and does not show the complex but necessary feedback that occurs between challenges, platform development and innovation. Nevertheless, it illustrates how the technology pipeline might operate to deliver timely and relevant solutions to global issues. Yet these are just possibilities, not probabilities. Without strategic investment in technology platforms, and informed nurturing of potential innovations into practical solutions, many of the technology innovations highlighted here will remain mere possibilities. This is at the crux of the challenge we face as we look to the future: how do we ensure that investment in technology innovation leads to innovations that we need to build a sustainable future, rather than simply innovations that someone can convince us we want? The potential inherent in rapidly accelerating technology innovation is immense. But this potential is easily matched by the magnitude and unprecedented nature of the challenges we face as a global society. Together, these put us on the cusp of a new era, where sustainable development will depend on new and integrative ways of navigating the opportunities and risks presented by technology innovation in an interconnected world.